It's been a warm month so far, by November standards. But it's still soup season, and root vegetable season, and I find few lunches more gracious than a well-garnished bowl of bisque and a hunk of crusty bread. This recipe adds a touch of garlic and smoke to the rutabaga's subtle, earthy sweetness. It's a rich and roasty soup that's smooth and calming and loaded with flavor. But it's not heavy. I added half a cauliflower because I had it, but it's by no means essential, and it's a cinch to make a vegan version. Usually bisques are weighted with heavy cream. Since rutabaga will soak up a lot of liquid before it thins to a proper bisque, I used half and half instead. Dairy-free folks could swap coconut milk for a similar effect. And, while most soups are only as good as the stock that grounds them, this one works as well with water as the other base liquid. Salting and roasting the roots first gives the purée ample flavor to withstand dilution. What's more, the roasted roots, puréed with just a little water or cream, make a lovely mash that would side well with a roast chicken, duck or turkey, since Thanksgiving's coming. 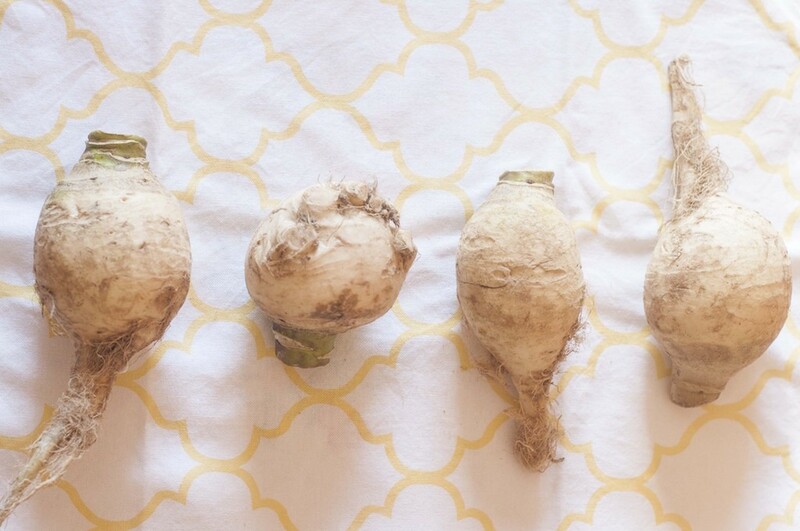 Not sure where to find rutabaga? Mine came from Full Moon Farm, but they vegetable is widely available at winter markets, or at your local market. Place a sheet pan in the oven and preheat to 425 degrees. Remove the papery wrapper from the garlic cloves, but leave the thick skin intact. Peel and trim the rutabagas. Cut these and cauliflower to a half-inch dice. Place the vegetables in a mixing bowl and toss with salt, spices and a hearty splash of extra-virgin olive oil until well coated. Spread the garlic and spiced veggies onto a sheet pan and roast for 45 minutes, stirring once about midway through. In the meantime, chop the onion and place in a small skillet with the coconut oil. Sauté over very low heat, stirring often, until the onion softens and browns. When the onion begins to char at the edges, deglaze the pan with a splash of water, cider, stock or white wine and kill the heat. After 45 minutes, remove the veggies from the oven (it's OK if they're still a little chewy) and peel the garlic. Turn all into the mixing bowl and toss with the onions and a light splash of apple cider (just a couple tablespoons — the idea is to bring out the brassicas' natural sweetness without introducing any discernible apple flavor). Purée the vegetables in a food processor. Add the liquids one cup at a time, alternating water/stock with cream, until the soup is smooth and thinned enough to coat a spoon but pours in a single, slow stream. Unless you have a very large food processor, you'll need to do this in batches. Place the soup in a saucepan over low heat. Whisk in the lemon, one teaspoon at a time, to taste, plus more cream, stock, salt and pepper, until you're satisfied with the flavor and texture and the soup is warm enough to serve. 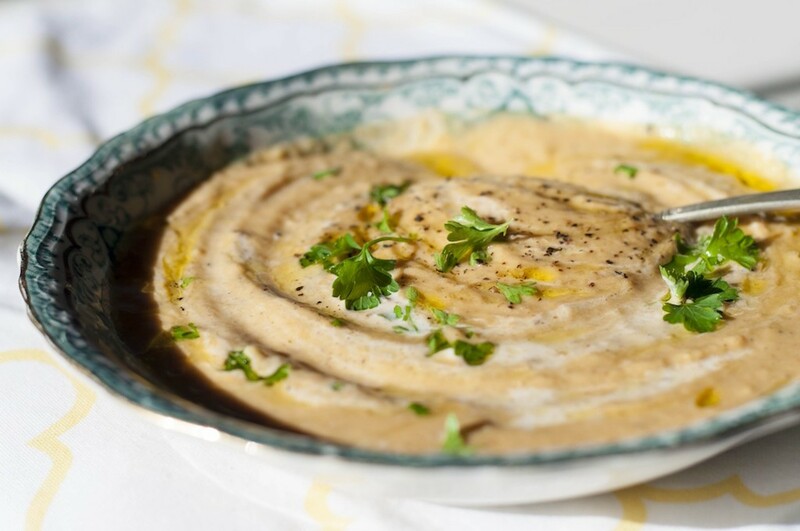 Garnish with drizzled extra-virgin olive oil, crème fraîche and fresh chopped parsley and serve with crusty bread.